Takatsu is a poet, novelist, designer, Wattpad Star, and co-founder of Dumagrad publishing partner Inspiritus Press. 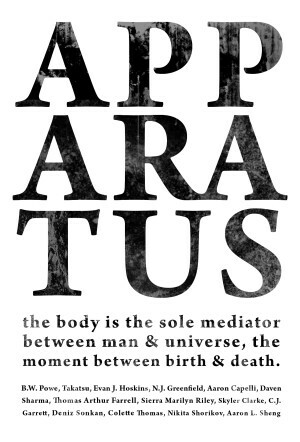 The body is the sole mediator between man and universe, the moment between birth and death. Sometimes, there may be unity, love, transcendence and liberation. Other times, separation, lunacy, limitation, atrophy, violence. In this collection of visionary, experimental poetry, prose and photography, the physical body and its relationships are celebrated, examined, distorted, dissected, exposed. Gritty and grotesque, surreal and transcendental, curated selections from 15 acclaimed and established authors, emerging student writers, local Torontonians or Literary Fiction Network contributors.